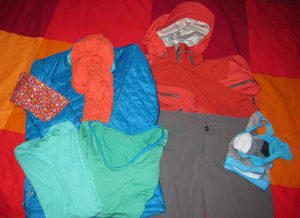 I have been struggling with what clothes to take to Australia. This is not our typical trip. It is a combination of dive, car travel and exploring, visiting family and friends and city trip. Our dive trips usually require just shorts, tees and swim suits. Our non dive travels usually take us to countries where it doesn’t matter if I look a little schlumpy and wrinkled. We are now going diving and to a “civilized” and fashionable country. On top of that, we are still carrying our dive gear and clothes in carry on luggage to ensure that it arrives when we do. We are taking an extra suitcase, that we will check, with various clothes and items for our kids, M&D. I have been trying to sort it all out in my head and finally had to start pulling out possibilities. I lay it out on the bed and leave it there for the afternoon, studying it every once in a while. That’s when that vanity thing starts to itch. Will I look okay when we go out for supper with M&D in that old skirt? Am I “fashionable” enough? ARRRRRRGG! I have to run errands, so I decide to make one of my stops Eddie Bauer to see if they have skirts that would be appropriate. I wander the store, try on a few items and then decide that what I have will be just fine. We won’t be supping out with M&D too much, so I will be just fine. Just fine! I keep telling myself. And it is only when we are in Gold Coast with M&D that I care. When Murray and I are alone traveling, I am not too concerned as Murray dresses very casual. Once home, I sort and pile the clothes I decide to take. I am going to sneak a shirt or two and an alternate “warm” layer into the checked suitcase for our Gold Coast portion of the trip. These items won’t go scuba diving with us, but will be available for the rest of the trip. Rain jacket – doubles as a blanket! Basically, I have a pair of shorts and 2 shirts for “daytime” wear. For “evening” wear I have a pair of shorts, a skirt, 2 dressier tops and a lighter warm layer. The “evening” shorts could also be worn in the city in the daytime to be slightly dressier. 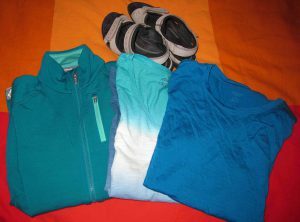 The pants, jacket, scarf, sandals, 2 extra shirts and heavier warm layer will stay in Gold Coast while we are on the dive portion of the trip as it will be warmer in the north. We are still two weeks out from leaving and I sometimes make adjustments, but I think I can live with this controlled vanity and what I have decided to pack for Australia. 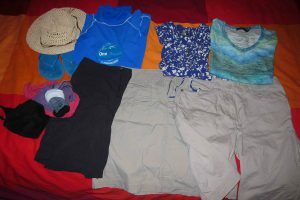 This entry was posted in Australia and tagged Australia, packing, scuba, scuba diving. Bookmark the permalink. Thank you for the comment! I struggle all the time with balancing the desire to look good and traveling carry on only, especially on a dive trip when 95% of my bag is dive gear.